Sometimes, this is what Christmas feels like to me. As a “friar in training,” I’m pretty poor. I have enough to cover all my my needs and a few of my wants, but there’s no room for saving or extravagance. This, I have absolutely no complaints about. One of the things that this forces me to do is to focus myself much better on the true meaning of the Advent and Christmas seasons. Most of my life I have been caught up in the “Season of Giving,” in which the holiday was dictated by things, either given or received; the great arrival that we awaited came in a box, not a manger. Even in the past few years when I’ve explicitly asked friends and family to abstain from buying me things, there has still been both a desire and a pressure to give to others (usually in the form of a purchased gift) which has inevitably led me to focus more on things and less on Jesus. Instead of focusing on the time as the “Season of Giving,” I’m going to try to see it as the “Season for Faith, Hope, and Love,” in which the three cardinal virtues will be my gifts to others. Understanding that gift giving is only one way to show affection to others, my lack of financial means will force me to try a number of the others: quality time, words of affirmation, acts of service, and touch. I certainly believe that it is situations such as these, facing circumstances that upset the status quo of our lives, that we come to see the world in a different (and usually better) way, learn a bit more about ourselves, and ultimately grow closer to God and neighbor. I pray that this Christmas will be one filled with new experiences centered around the hope and joy of the coming Lord. Your words are very thought provoking. 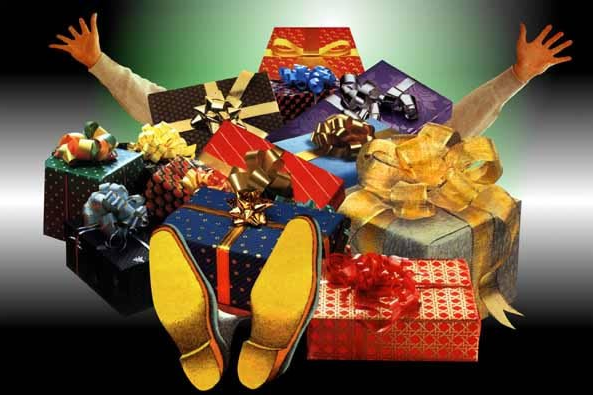 The gifts you will give this season are the greatest of all. Anybody receiving them, are the wealthiest of all. Have a very blessed and happy holiday. I’m right with you! Who’s birthday is it anyway? The best gift we can give Jesus is to share HIS love with all those around us. As they say, “Jesus is the reason for the Season.” Now, have a Merry X-mas … JUST KIDDING!!!!!!! Once again, we received an invitation to an X-mas party, really! I hope and pray you will find so many blessing this Advent in the way you are experiencing Christ’s coming.